What are paints and coatings composed of? This efficient reference book offers an optimum overview of the different constituents of the different types of coatings, explaining the chemistry, system and impacts of coating raw materials. That way, newcomers to the field of coatings gain a quick basic knowledge whereas chemists and laboratory assistants will find valuable insights on future trends and developments in the field of raw materials. The coating industry is highly raw material intensive and uses a wide range of these raw materials, from relatively inexpensive minerals to high performance polymers and pigments to highly engineered specialty additives. Understanding Coatings Raw Materials intends to provide a comprehensive overview of the raw materials used in contemporary paints and coatings. Significant advances have been made in the field of polymeric materials and coatings during the past few decades. Ever since the negative impacts of solventbased coatings on the environment and human health were recognized, the coating industry has been striving not only to address these impacts but also to offer better performing products to meet the ever growing demands to decorate, protect, and provide new functionalities to surfaces. This has led to the emergence and commercialization of such advanced technologies as waterborne coatings, high-solid coatings, powder coatings, radiation curable coatings, and bio-based as well as nanomaterial based coatings, to name a few. The raw materials used in today’s advanced coatings are incredibly diverse and innovative compared to those used a few decades before. Understanding this growing palette of coating raw materials and their specific roles and interactions with each other is increasingly challenging, both for new entrants as well as those already working in the coating industry. This book is divided into five chapters. The first chapter introduces readers to the historical development and fundamentals of coatings and their compositions, thus putting the topics that follow into perspective. The following chapters cover individual families of raw materials – resins, pigments and extenders, solvents and additives – with adequate detail and practical examples in keeping with the scope of this book. This book in hand is intended for people involved in sectors of the industry related to research and product development, production, quality assurance and testing, the supply chain, coating system specifications, technical service and marketing. 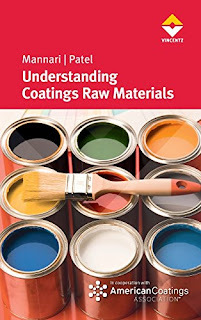 Due to the extensive coverage of these topics, this book will also be very useful for undergraduate and graduate students seeking to learn the fundamentals of coating raw materials. It will also serve as a reference book for any reader interested in paints and coatings. 1.1 Why paints and coatings? 2.1.2 Thermoplastic and thermosetting polymers. 2.4.5 Polyesters for powder coatings. 2.5.1 Chemistry of unsaturated polyester resins. 2.7.2 Types of amino resins. 2.9.1.4 Brominated BPA epoxy resins. 2.9.3.4 Carboxylic acids and anhydrides. 2.9.3.5 Phenolic and amino resins. 2.11.3 Polyurethane resins and coating systems. 2.12.3 Blends of silicone resins. 3.1.2 Nomenclature – the Colour Index system. 3.1.3.1 Classification based on color. 3.2 Important properties of pigments. 3.2.3 Chemical and performance properties. 5.8.2.3 Acid catalysts for baking systems.